The single largest superconductor procurement in industrial history is drawing to a successful close. An eight-year campaign to produce the superconductors for ITER's powerful magnet systems is in its final stages, with nearly 70 percent of the conductor unit lengths accepted by the ITER Organization. Six ITER Members—China, Europe, Japan, Korea, Russia and the United States—have been responsible for the production of 200 kilometres (2,800 metric tons) of cable-in-conduit conductors, worth an estimated EUR 610 million. Without superconductivity, the pursuit of fusion energy would be impossible. Superconductors consume less power and are cheaper to operate than conventional counterparts, while carrying higher current and producing stronger magnetic fields. In ITER an array of superconducting magnet systems, with a combined stored magnetic energy of 51 Gigajoules (GJ), will produce the magnetic fields that will initiate, confine, shape and control the plasma at temperatures reaching 170 million C°. The building blocks of the magnet system are high-performance, internally cooled superconductors called CICC (cable-in-conduit) conductors, made up of bundled superconducting and copper strands that are cabled together and contained in a structural steel jacket. ITER's extraordinary technical requirements and the sheer amount of material required—200 kilometres, equivalent to 2,800 metric tons—resulted in a worldwide collaborative procurement effort involving ITER Members China, Europe, Japan, Korea, Russia and the United States. Beginning in 2007, the ITER Organization pioneered a global procurement strategy to establish the processes and systems to ensure the standardization of conductor production and testing around the world. Eleven conductor Procurement Arrangements were signed with the ITER Domestic Agencies between 2007 and 2009—each one defining technical and quality control requirements such as the qualification of suppliers, the qualification of manufacturing processes, control points at critical manufacturing steps, and the testing of representative full-size conductor samples. Production has been underway since 2008, with painstaking oversight by the ITER Organization and the Domestic Agencies. Outside reference laboratories have contributed their expertise, performing third-party verification on critical acceptance tests. For the most technically challenging raw material—the niobium-tin (Nb3Sn) superconducting strands used in ITER's toroidal field and central solenoid magnet systems—500 metric tons (more than 100,000 km) of strand were produced by nine suppliers. This large-scale industrial effort demanded a ramp-up of global production capacity from 15 metric tons/year to 100 metric tons/year, as well as the introduction of three new strand suppliers. 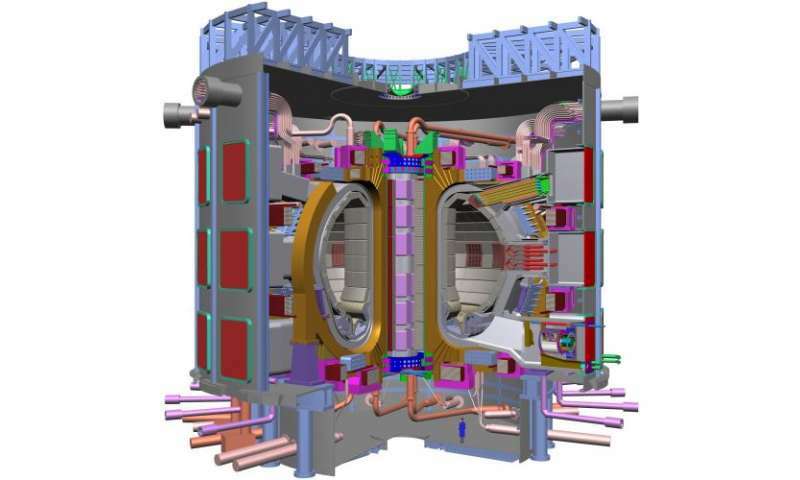 To date, nearly 70 percent of the produced conductor unit lengths have been accepted by the ITER Organization. At a ceremony on 17 September 2015, a plaque was unveiled in the ITER Headquarters at Saint-Paul-lez-Durance, France to acknowledge the contribution of many different partners in the success of the ITER's longest-lead procurement campaign. "The 11 conductor Procurement Arrangements have posed many technical and management challenges, but they have also been an amazing human adventure," says Arnaud Devred, ITER head of Superconductor Systems & Auxiliaries. "I credit many people—past and present—for the success of the ITER conductor effort." Magnet Division head Neil Mitchell, who has stewarded the development of the ITER conductors since 1992, agreed: "It is inspiring to see the ITER conductors as a reality after a development program that goes back over 30 years, with ITER partners working as a team to master the complex technologies involved." ITER Director-General Bernard Bigot emphasized the project's multi-faceted nature: "This milestone is remarkable on several levels. Economically, we have injected EUR 610 million into industrial companies and laboratories around the world, which have now gained invaluable expertise that can be applied in other critical fields such as medical imaging, energy, and transportation. Technologically, we have used the latest materials science while pushing production to unprecedented levels. But perhaps the greatest achievement is reflected in the successful multinational collaboration on design attributes, production standards, quality assurance measures and testing protocols for a project of this technical complexity. We will continue to build on this success." The next stage in the fabrication of ITER magnets is the integration of the superconductors into the final coil assemblies.